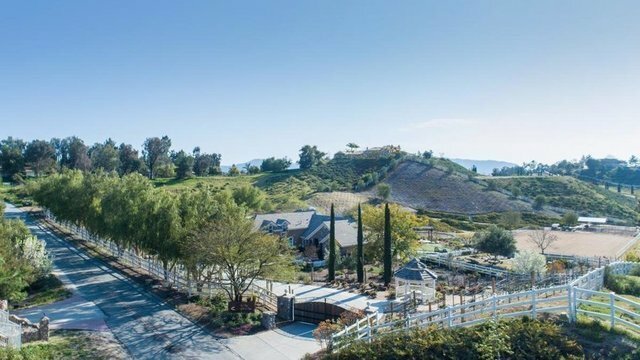 Located in the Heart of Temecula Wine Country, here you will find this elegant French Country Horse Property Estate, nestled in the prestigious Country Roads Estates Community. This property offers 4,600 sq. ft. of luxury residential living space: main home featuring 3 bd/3 baths downstairs, living room w/fireplace, dining room, office and kitchen open to family room w/fireplace, laundry rm w/Wine Cooler Closet storing 240 wine bottles w/single set control, upstairs bonus room and bathroom and attached 4car garage w/finished floor, storage and air conditioner. Many upgrades too numerous to mention all; tray ceilings, travertine floors, French doors, plantation shutters, built-in cabinetry/desks, entertainment center, leathered marble countertops, Viking and Sub-Zero appliances. Detached Guest House w/1 bd and 1 bath, living room w/fireplace and kitchen w/laundry closet and tankless water heater. Property is gated providing controlled access, RV parking with 35/50 amp electrical services, guest parking at front courtyard, 72' long American made Barn of 432 sq. ft. w/AC, office/tack room, round pen, horse arena, turn-out corrals, Gazebo, 3 Patios, outdoor 60” TV, Fire Pit, wind and sun screens, outdoor Kitchen with Italian Pizza Oven, pool, spa, Pergola w/Hammocks, Putting Green, Organic Vegetable Garden. Beautiful westerly breathtaking views. Paid solar with 2 converters, electricity approximatley $117 mo. Property completely landscaped including vineyards and Nebbiolo grapes bottled by a local winery.